It’s a first for Janie! 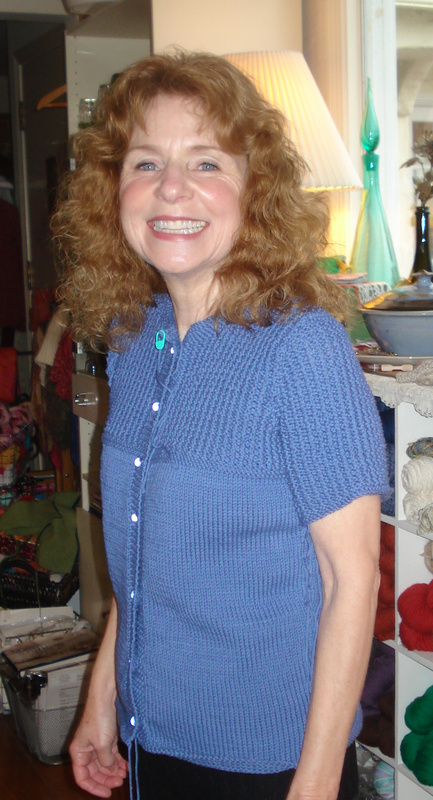 Janie joined one of our knitting workshops a couple of months ago. She not only embarked on a sweater but it was her first…..and it’s done. 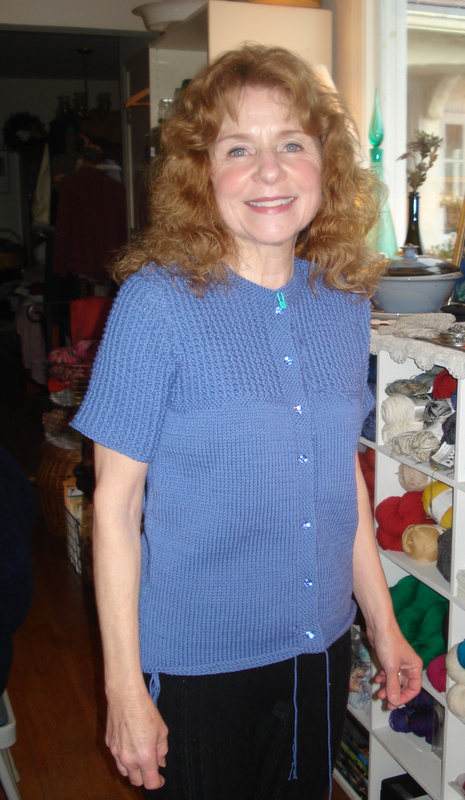 Her inspiration for her garment came from Creative Knitting Magazine, Sept. 2009. It’s called Short-Sleeved Cardigan and the skill level is just a bit harder than “Easy”. Janie is not sure that she agrees with that description. As I often say, use the pattern as the beginning of the road map for the knitting trip and then feel free to take diversions. In this case, we changed the yoke pattern, the placement of the top buttonhole and the yarn. The yarn that she chose was Brown Sheep’s cotton fleece…an old time favorite of mine. Back to the yoke pattern for a moment. The designer of the pattern had in mind that the yoke would be the Trinity stitch…sometimes known as the Bramble Stitch. Janie has a shoulder injury that was not compatible with this pattern. I suggested that she use the Pebble Stitch aka Sand Stitch I didn’t find a good link for that …so here is the reversible stitch pattern. This is a 2-row pattern – Row 1: Knit; Row 2 – Knit one, purl one. She is really pleased with the results! Congratulations to Janie for a job well done. 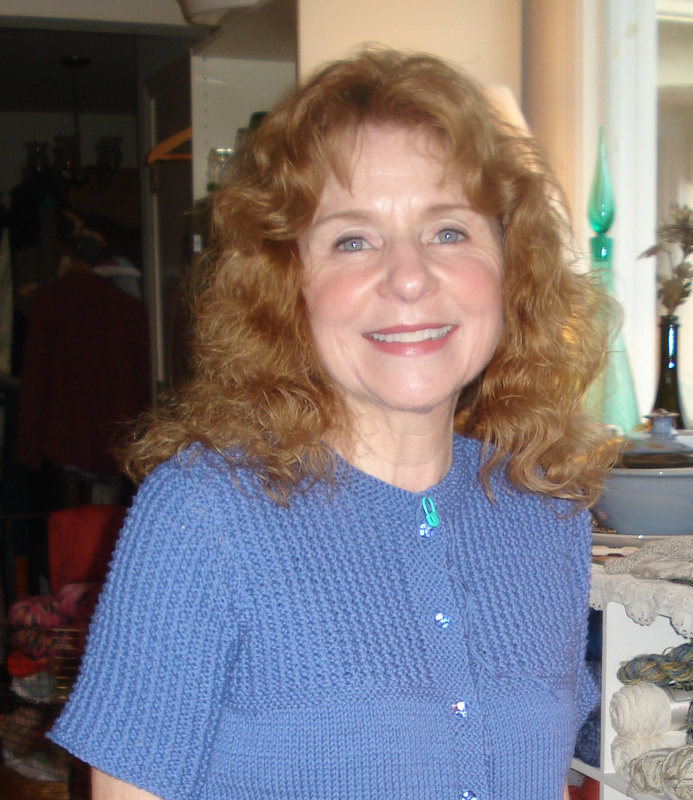 An aside for Janie…..she not only knits, helps with her grandchildren, she designs jewelry. Check out her website.